Opened in November 2012, we have been attracting backpackers worldwide. 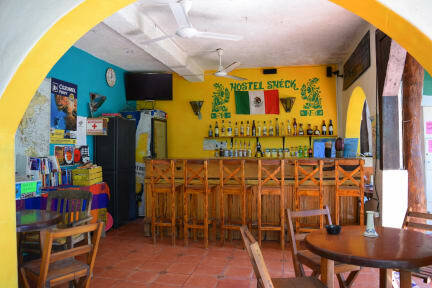 Hostel Shéck (Xéek a Mayan word, which means 'mixture' in English) is a laid back hostel with a lush garden to relax, 'mix' with other travelers (or not – you choose! ), have a good time and party at our affordable, friendly bar, and explore everything the Mayan Riveria has to offer. We see ourselves as “Tulum’s party hostel alternative”….have fun yet know you will get a good night’s sleep ready to tackle the sights and activities the area has to offer. Cook up a meal in our fully-equipped industrial kitchen; relax in one of our hammocks with a cool drink; or have our multi-lingual staff recommend: sites to see; how to get around; visiting the ancient ruins;, best beaches; snorkel and scuba gear/lessons; bike rental; where to shop; or the best way to move on to your next destination. We welcome the long-term traveler, diving course students, and those looking for more than just a party hostel experience. 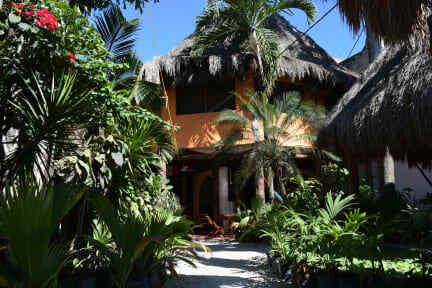 Enjoy your stay at Hostel Shéck with the best beaches and cenotes in the Riviera Maya! Reception 8am - 10pm - There will be NO check ins out of these times. Please email before reserving to see if it will be possible to check in outside of these times. This property is not suitable for children. Clean, well located. No complaints. Thank you! Good value compared to the average hostel cost in Tulum. Staff are sweet. Breakfast is small but good and I like how it is made for each individual. Wouldn't say there is much of an atmosphere here and the dorm bathroom is pretty grubby. Overall decent place, would stay here again. Overall a great place to stay for the price you pay. The showers and restrooms were always clean. Amazing jungle feel. Breakfast was nice. The stuff was amazing. Genuine smiles, really helpful and always there. My main issue were the beds. The mattresses had this synthetic leather finish, meaning that the bed sheets were always coming off during the night. Kind of uncomfortable sleep. Nice place with a chill vibe. Cute outside common area. Hot showers! staff were nice and helpful. I found it quite quiet, which could be good or bad depending on what you're looking for. Pros: excellent location, nice breakfast included in rate, cheap beers at the bar. Cons: it seemed that the bathroom upstairs in the main dorm is rarely cleaned, because no one had noticed that the soap and toilet paper had run out, and also it smells like there is p***s all over the floor and the bin is full of gross toilet paper. Also there was all this rubbish on the floor behind my bunk. Overall happy with the hostel but it needs more attention to cleaning esp the bathroom. Good breakfast. Beds were very basic and pillows were lumpy. Cabins were not insulated and were very cold in the winter (January)! The location was also noisy and we were woken up by street vendors and construction noise around 8 am. They don’t rent out towels? There is no hot water, the bathroom in the main dorm is dirty. Toilet paper wasn’t replaced for 12 hours. I forgot a shirt beside the locker area for a few hours and the cleaning staff said it was nowhere to be found. The hostel was overbooked and someone was sleeping in my bed. The staff said they couldn’t give me sheets because they didn’t have the keys to the linen closet. I had to share a bed with a stanger and wasn’t given money back. Just stay somewhere else.